Sometimes it's not enough to travel with just your clothes. Sometimes you need to bring some refreshments along too. 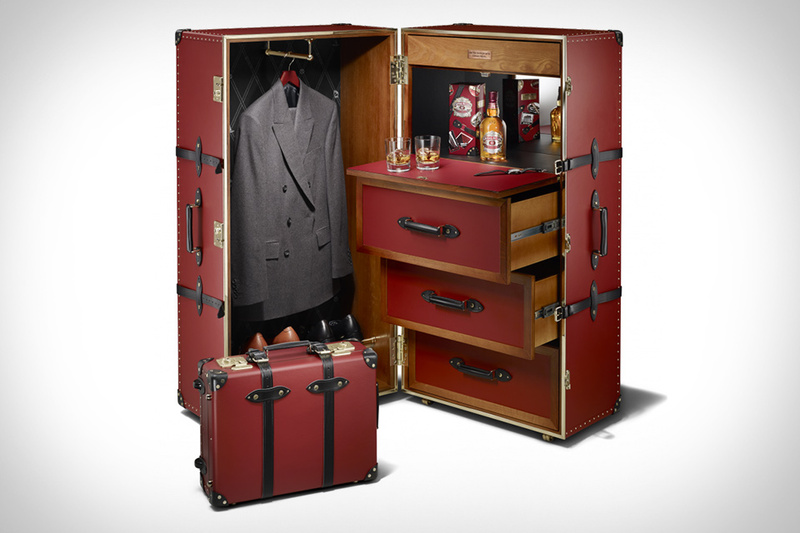 The Globe-Trotter x Chivas Steamer Trunk lets you do both in grand style. 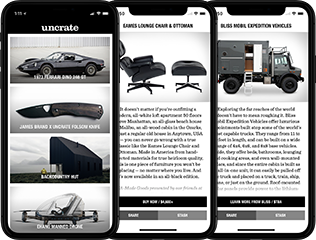 The interior of the trunk has dedicated compartments for watches and shoes, leather-covered suit hangers, and a mirror-backed mini bar that folds out of the side. The custom lining honors the legacy of both brands, while the American white oak drawer linings and hand-engraved copper plaque reclaimed from a Scotch whisky still make the link to Chivas readily apparent to anyone who cares to look. Backpacks aren't just for the back to school crowd. The Everlane Modern Backpack lets you carry your laptop, notebooks, and any other gear you need on your back without looking like you've got a matching lunchbox in there. The Zip model offers a slip pocket on either side, a zip pocket up front, and a spacious main compartment. It's joined in the lineup by the compact Mini Zip, as well as a Snap top model, all available in various tasteful hues. With a volume of 20 liters, the Poler High & Dry Pack is an ideal everyday bag with the added ability to keep your stuff dry. The outer body is made from splash-proof 300D Campdura, with a 600D Campdura reinforcement on the bottom and 190D Campdura lining. A rolltop design and waterproof zippers from YKK add more wetness protection, and there's also a built-in zipper for adding a dry bag to the interior, creating a dual compartment system. It has a padded laptop sleeve on the inside, an accessory pocket on the outside, leather trims, and comes two colorways. Hobos have a rough life — but they definitely know how to pack. The Hoboroll takes inspiration from their bindles, offering 20L of capacity in a cylindrical pack just 10" in diameter and 15" long. It's made from rugged 30D ripstop nylon, uses five different segments to keep your stuff separated and two aluminum sliders to keep it compressed, and offers a secret inner zip pocket to keep valuables safely tucked away. Great for short weekend trips or nomadic journeys aboard the box cars of freight trains. The result of two years of work, featuring over 98 unique details and hand-assembled over the course of 50 hours, the Moreca Aviator PH-1 Backpack is an impressive piece of workmanship. Its exterior is crafted from vegetable tanner leather that's treated, dried, and polished to give it a naturally-worn look, while all the interior surfaces are suede. Those include a main compartment with inner pocket, and a hidden inner pocket that you can access from the quilted back. Arrives with nickel-plated brass hardware and a unique serial number and data sheet, and limited to just 99 examples. If you're familiar with the TUMI brand, then you already know that each piece of luggage is designed and outfitted with class and quality. The 1975 International Carry-On is no exception, and might even raise the bar a bit higher in the luxury travel market. The four wheeled suitcase pays homage to the year TUMI was founded, and is crafted with ballistic nylon and tan natural leather imported from South America. It also boasts solid aluminum tubing in the handle, impact resistant DuraFold construction, and the Tumi Tracer bag locating program. Arrive at your next backyard grill out with not only the right beers, but the right method of transporting those precious bottles as well. The Sixfold Beer Carrier is the vessel your craft beers deserve, made using vegetable-tanned English Bridle leather, with spines made from American Walnut sourced from the Ocooch Mountains in Wisconsin. This massive upgrade to the paper carrier you usually tote around not only looks legit, but is also built to last for the long haul.